This year, my Christmas was more adult that ever – we didn’t even open presents until 3 pm on Christmas day and skipped the crazy Christmas Eve masses for a quieter one on Christmas morning. I had a wonderful time in the presence of my closest friends and family and wanted to serve them the best dishes possible for their holidays! Traditionally, my family has served rosemary crusted lamb chops for Christmas Eve, yet we never seem to find chops with enough meat on them from the butcher. 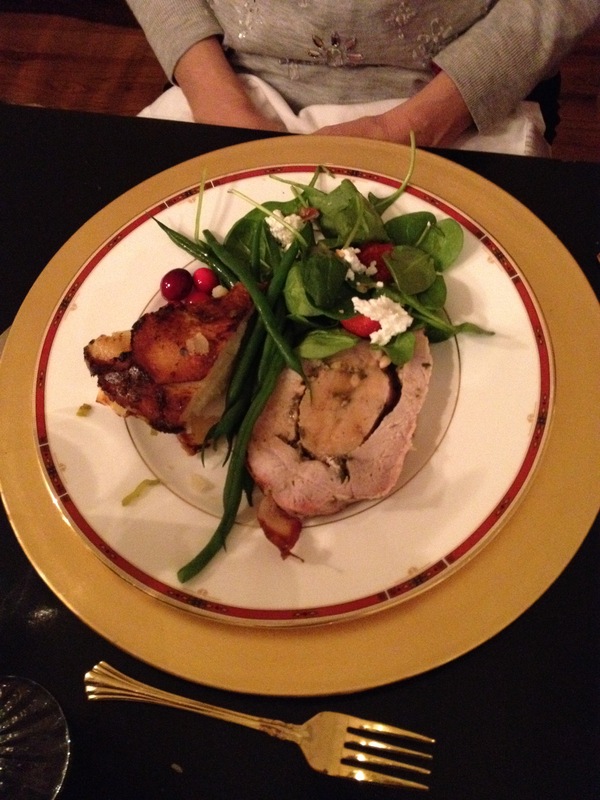 This year, I thought a stuffed pork loin might be comparable and fulfill all the shortcomings of the lamb chop – tender, juicy meat that goes well with the same herby, garlic crust we like on the lamb. Turns out nobody on the internet had exactly what I had in mind. I really wanted to have the pork stuffed and rolled in a spiral so you could see all the pretty herbs on the inside, and I wanted to marinate it for at least 8 hours to ensure the flavors soaked in completely. Thanks to all of you who helped me with your recipe recommendations! 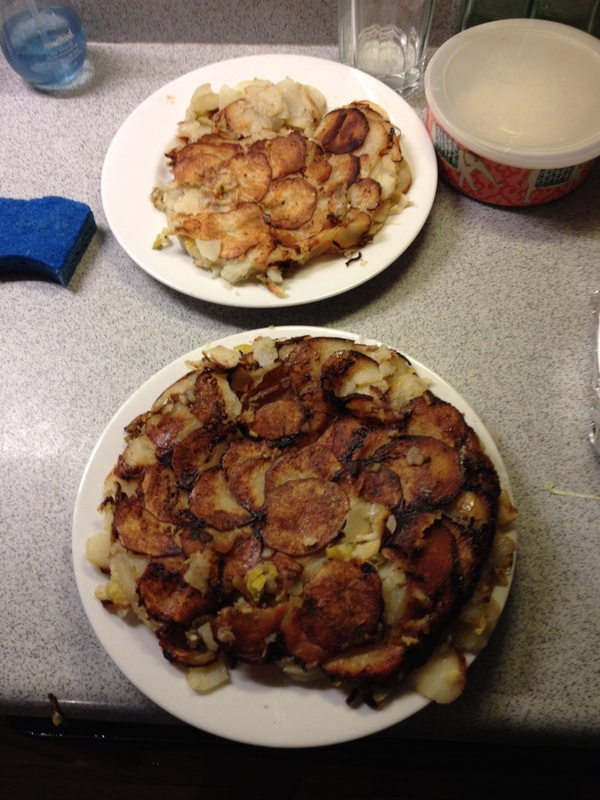 Here are some of the best ones that were recommended to me that influenced this recipe! 1. Prepping the pork loin: To ensure the maximum flavor richness and moisture, the best thing is to marinate the pork in the morning or the night before you’re going to cook it. This will also help if you’re pressed for time at night making other dishes and want to make it easier on yourself 🙂 Rinse the pork off if it’s in plastic packaging, and pat dry with some paper towels (getting it dry will help ensure the pork gets crispy). 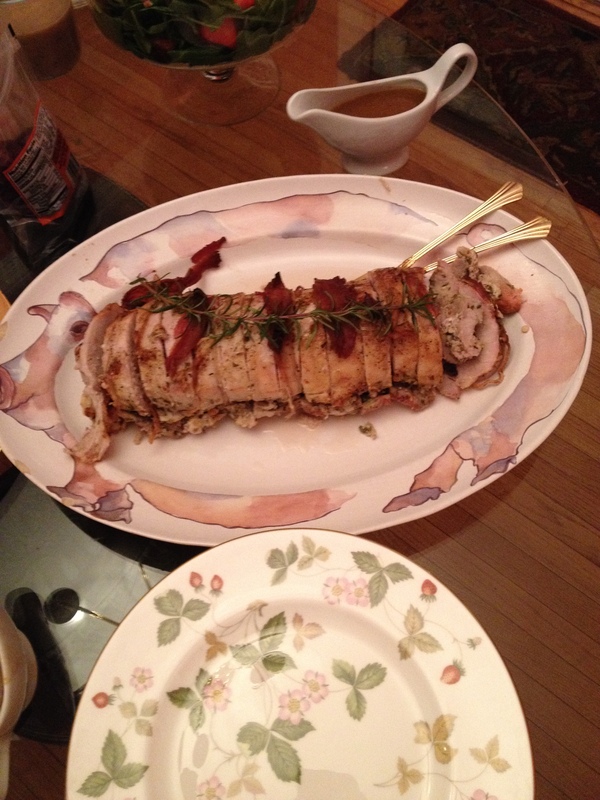 Here’s the best video I could find for butterflying a pork loin in thirds, but I can explain briefly as well. If you watch that video , skip to 1:13 for the important stuff. Also make sure to listen to T-swift jammin. 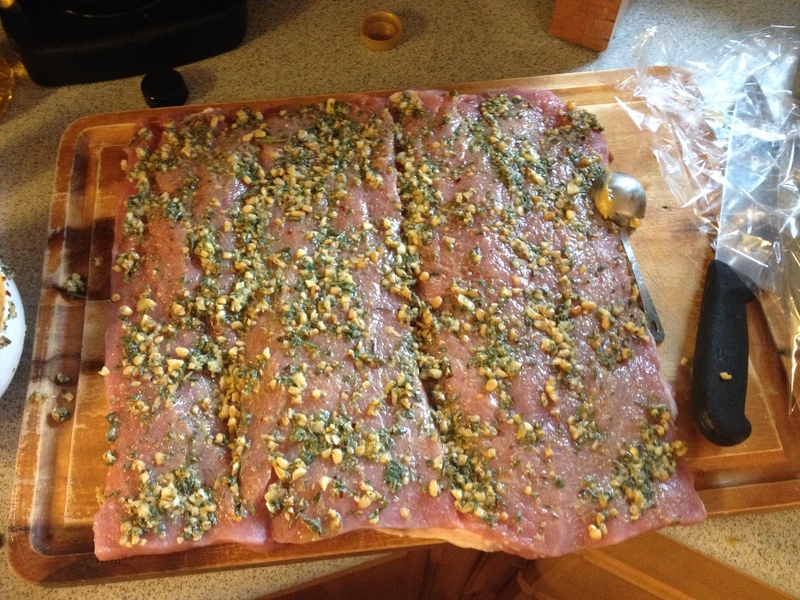 You want to make this big rectangle so that you’re able to roll up the pork and seal in the herbs. If you’re facing the short end of the pork you want to cut along the width of the pork so that it will open up like a book. We want to cut it twice so you’ll triple the width of the pork. Start cutting from the opposite short end of the pork to the bottom and the point you’ll pick is where you’ve cut about a third of the height of the pork. So, 2/3 of the pork is still together and we’ll cut that part in half in a minute. Cut the pork from the right into the center until it looks like a book and you’ve cut almost all the way through the spine. At this point, start from the “spine” and cut the 2/3 portion of the pork that’s still together in half so you’ve formed like a tri-fold poster board (for all you science fair experts). Here you are! If I’ve confused you thoroughly, watch the video above a few times. Cover the pork with plastic wrap while prepping the herbs. 2. 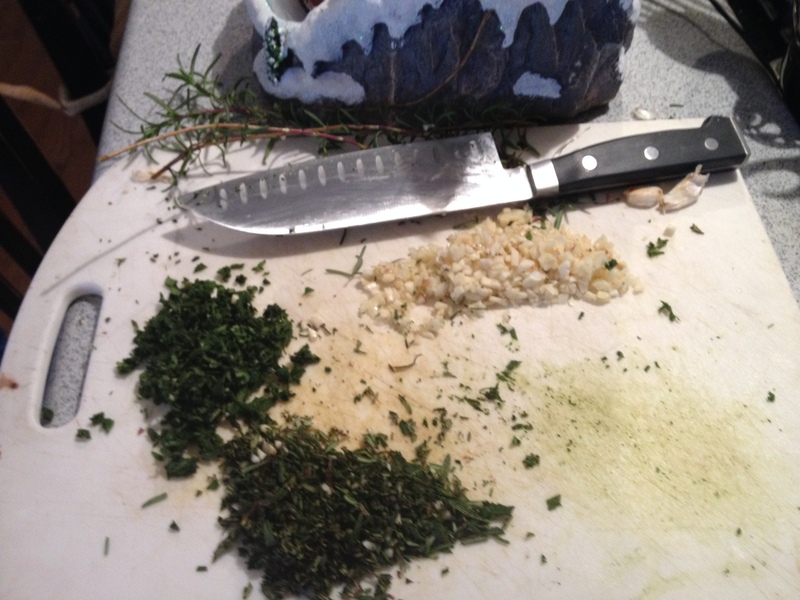 Chop up your herbs and garlic. The herbs dont have to be perfectly minced or anything, just not so big that you’d take a huge bite out of a rosemary stem. 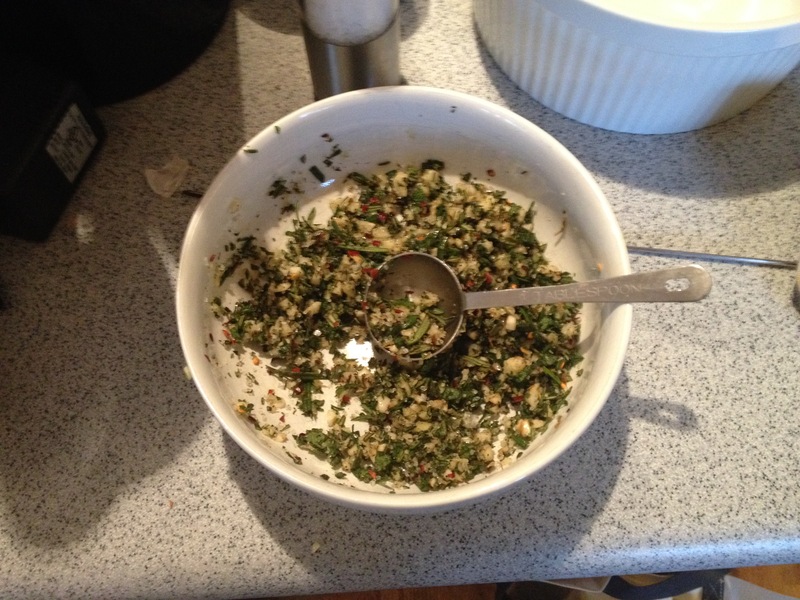 For the garlic, I minced it and then used the side of my knife to crush the garlic into a sort of paste. this can help get more of the flavors out of the garlic. For the pine nuts, I toasted them briefly then chopped them lightly. 3. Mix your herbs, garlic, salt, pepper flakes and black pepper, olive oil, mustard, and pine nuts in a small bowl and drizzle with olive oil. Try to press them together with the back of your spoon to make the whole mixture meld together. 4. Take the plastic wrap off of the pork and start massaging the herby mixture onto the pork (yea we’re getting graphic here). If you think it looks a bit dry, drizzle some olive oil over the pork and press it all into the pork. 5. If you have somebody around, this is the part where it’s helpful to have help!! The same way that you cut the pork is the way to roll it up. 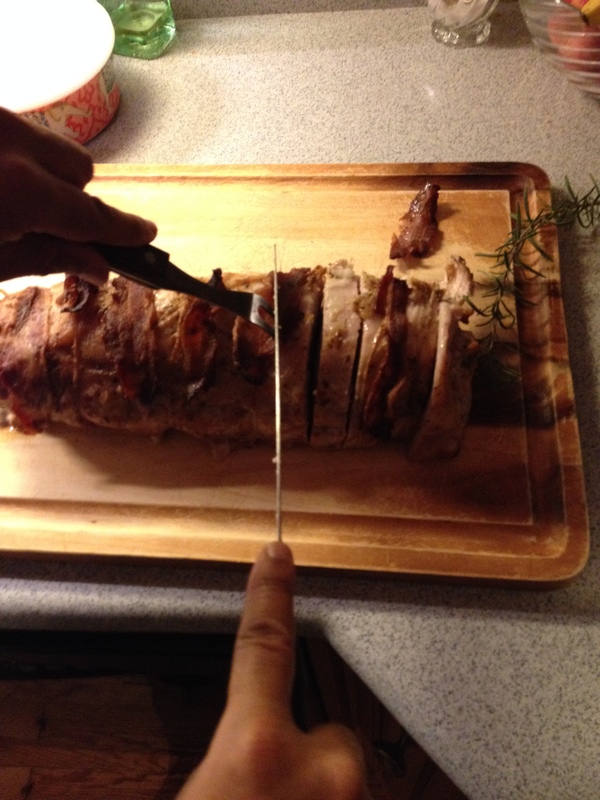 Starting from left to right, roll the pork into a log, making sure your stuffing stays inside. Once you’ve rolled the log tightly, use twine or thread to tie the roll together. I used about 5 pieces of twine and knotted at the top after rolling the log up. 6. 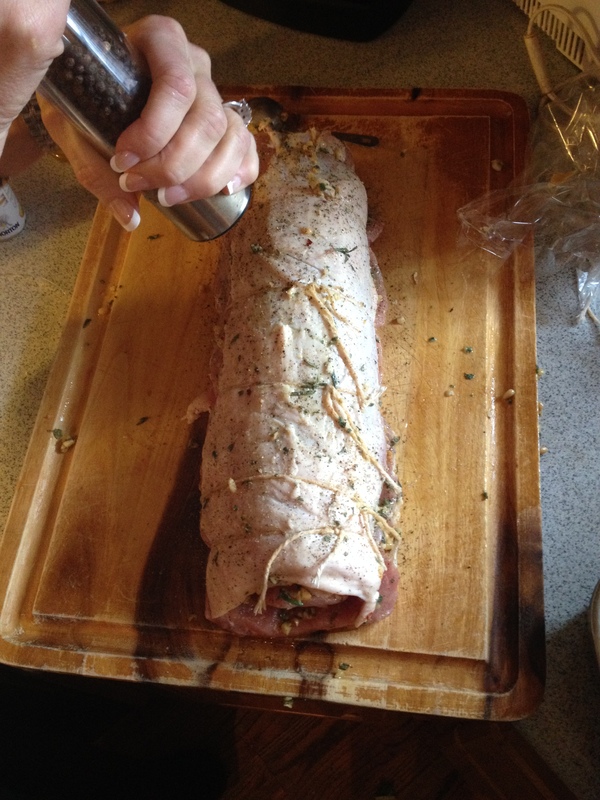 Drizzle some olive oil on the outside of the pork and coat with any leftover filling, salt , and pepper. 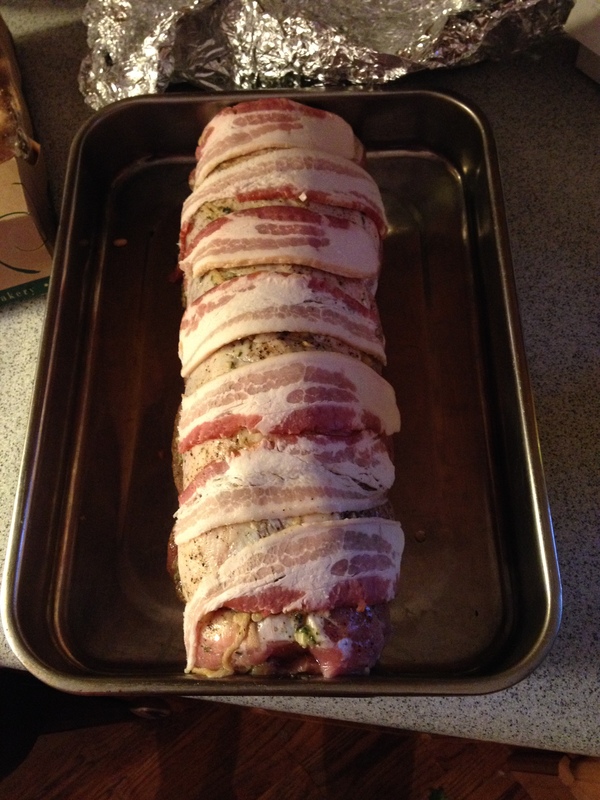 Cover with foil or plastic wrap and put in the refrigerator either overnight or at least 8 hours before ready to cook. 7. 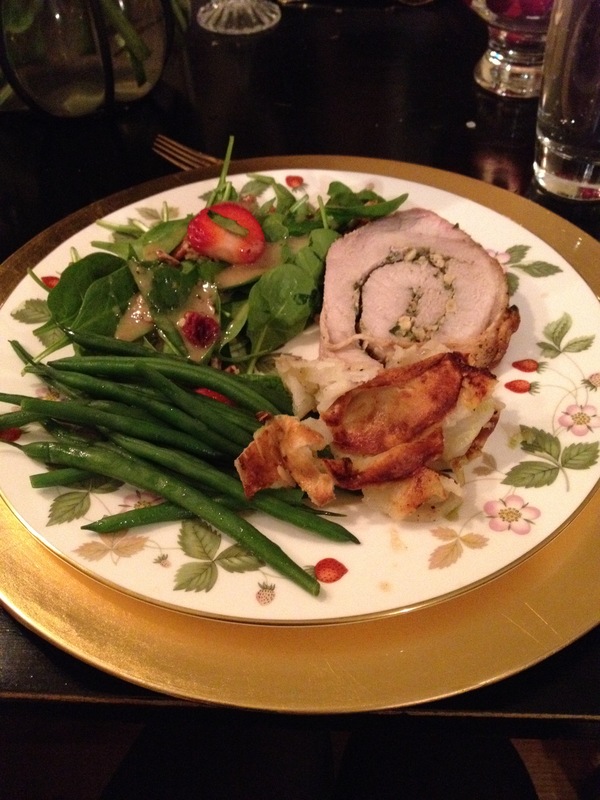 One to two hours before cooking the pork, take it out of the refrigerator to let the meat come to room temperature. 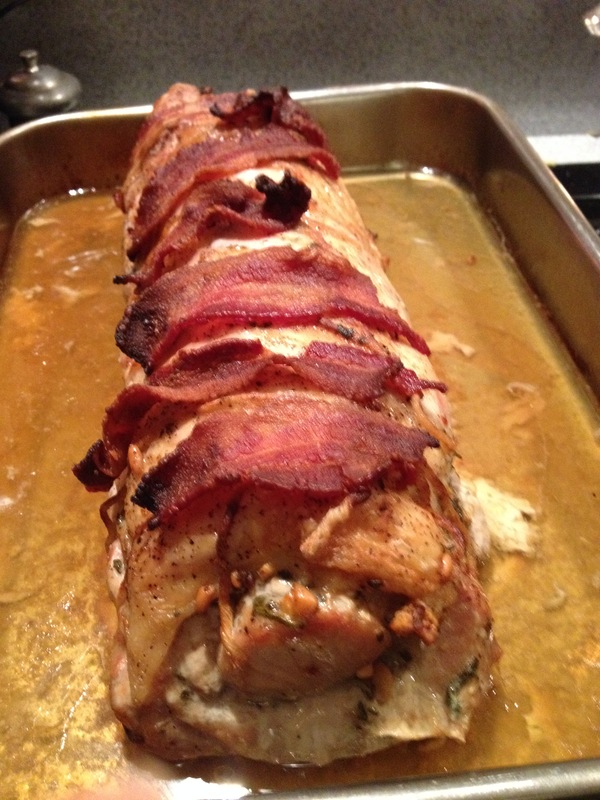 Get your bacon out and drape over the top of the pork (this was a game time decision for me and such a good call). I cut the pieces of bacon in half. 8. Heat the oven to 450. Place pork in a roasting pan and place in the oven. We’re getting a crust on the pork before dropping the temp to cook the inside. Roast at 450 for about 10 minutes then drop the temperature down to 350. Make sure not to cook too long at 450 or the bacon will burn. Add the chicken broth to the pan to keep the pork moist. 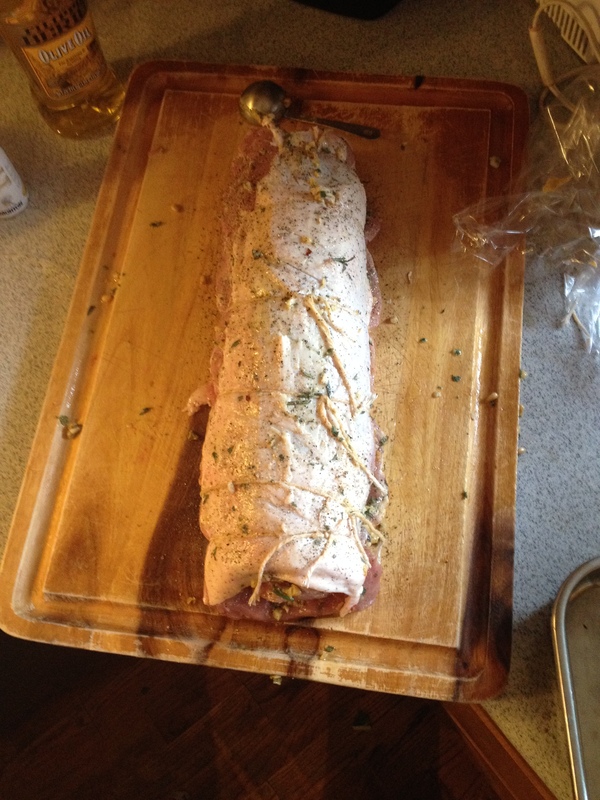 Bake at 350 for 60-75 minutes, or until a meat thermometer stuck in the middle of the pork registers 145 degrees. 9. Take pork out of the oven and cover lightly with aluminum foil for 20 minutes. This will seal in all the juices. Slice into coins/rounds and serve!! !